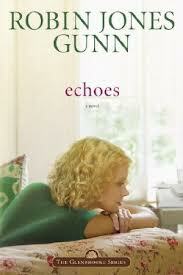 After reading the first book of the Glenbrooke Series, I was interested to read more from Robin Jones Gunn. Echoes introduces the new character of Lauren Phillips (Wren), a recently heartbroken romantic, who is hoping love will come right to her door. When her brother sets her up with an old computer, the nontechnical Wren develops an unexpected email relationship, which grows into a budding romance. The majority of the story is not set in Glenbrooke, which surprised me, but it does creatively connect with Glenbrooke as the story weaves along, making a great addition to the series. The beginning of Echoes was a bit slow for me, and I was unsure where the story was going; but it soon picked up, and exceeded my expectations. I think the careful start actually accelerated the romantic intensity toward the finish. I found the end quite romantic, and the various twists in the plot kept me on edge. I also enjoyed the way the story connected back with the familiar Glenbrooke characters. This Christian series is light, romantic, has great, relatable characters, and is the sort of refreshing read that soothes and encourages. This didn’t happen recently, but is something I’ve been wanting to get out in writing: I had neglected to test the spirit of a particular sign I was seeing in the spiritual realm, and it turned out to be really harmful. I had assumed God was speaking to me through this sign, but instead, it was a former familiar spirit trying to win me back. What is Aaron seeing? The biblical text doesn’t tell us. The first it is italicized because it doesn’t exist in the original Hebrew: it reads more like, “when Aaron saw, he built an altar before it [the calf].” Aaron had just created the calf with his own hands, so it doesn’t seem likely that he would immediately forget what he had done and declare the calf is god–especially not the same god who delivered them from Egypt. It’s more likely he was seeing something spiritual. It’s much harder to describe seeing or perceiving the spiritual realm, so if Aaron saw something there, he may not have understood what he was seeing. Probably, he saw something spiritual, assumed it was a spirit of God, and assumed God was blessing the calf with His presence. Because Aaron connected the spirit of God to the golden calf, it became an object worthy of devotion. If he had considered his actions, he may have realized his error; but it seems he was acting without much thought. This is, at least, what I recognized I had done. I didn’t intend to do it. I was seeing something I couldn’t describe. I’d mentioned it to several Christians who–without seeing it for themselves or having any experience with it–had encouraged me that God was showing me this seemingly positive sign as evidence of His favor and blessing in my life. And meanwhile, I was becoming increasingly physically ill and emotionally tired–and seeing the supernatural sign an average of four times a day, each time thanking God that He was blessing me. And I didn’t once consider that I should ask God regarding it. At one point, I was researching something completely different and came across an article that the thing I was seeing meant spiritual distortion and chaos, but I was so convinced by my initial assumption that I disregarded the evidence without a second thought. It is amazing, looking back, how quick I was to be confused–all because I had neglected to test the spirits, or ask the Lord what I was seeing and what it meant. It is a blessing I was eventually able to discover the truth and reconsider (and repent for) my mistake. 1 John 4:1 says: “Beloved, do not believe every spirit, but test the spirits to see whether they are from God, because many false prophets have gone out into the world.” And to the church in Corinth, Paul warns that the devil disguises himself as an angel of light (2 Cor 11:14). The stakes are too high not to test every spirit, every sign, and every supernatural experience. Every good thing comes from God, but not every attractive thing is good. 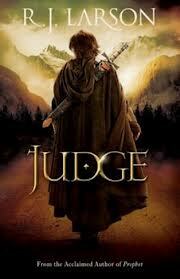 Judge is Christian Fantasy at its best. The writing is reminiscent of Tolkien’s style, but more closely parallels the history set forth in the Scriptures. Destruction is about to come on the city on Parne, but the Infinite calls Prophet Ela Roeh to warn the citizens and urge them to repent and turn their hearts back to Him. Meanwhile, Tracelander Judge, Kien Lantec, is called to step out of his usual role, and prophesy over a city he does not particularly care for. Kien’s feelings for Ela complicate matters as he worries about her while also discovering his own new calling and purposes. Ela, likewise, tries to stifle her feelings for Kien in order to remain focused on the Infinite and her very dangerous mission. It’s a story of romance, action, and suspense, discretely laced with biblical and theological insight. The story also explores the biblical positions of Prophet and Judge, along with the relationship between the people and their Creator, the Creator’s love and faithfulness amidst disaster, and even the supernatural gifts that are given to those who serve Him. The story has tons of biblical parallels, which I appreciated. And I also found it easy to identify with the characters, and the honesty of their thoughts and experiences. I do recommend reading this series in order, as I found it a bit difficult to keep the many characters straight in the few few chapters, having not yet read Prophet (the first in the series). I look forward to reading the novels to come.